What goes on when the rest of Richmond hunkers down? By shadowing late-night shifts in the shadows of late nights, we learn a little more about what makes this city tick. Uber drivers block the road intermittently as bar-goers flood the streets, headed to their next destination while avoiding the looming storms that the warm summer night promises to bring. I hop in an unmarked Chevy Impala at the corner of East Cary and South 15th streets, right in the heart of Shockoe Bottom, not really knowing what to expect. It’s late, but the Richmond Police Department (RPD) has already been monitoring these streets for two hours, and we’ve got at least another four ahead of us. 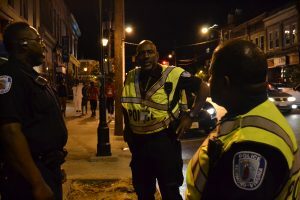 For the past 4 years, every Friday and Saturday night, Lt. Erlan Marshall and Detective Amos Jones have managed the 10th to 19th street blocks of The Bottom in downtown Richmond. The Bottom is one of the city’s oldest neighborhoods – lying just east of downtown and hugging the James River’s most distinctive bend. It’s no surprise that this area – easily walkable and chock-full of bars, nightclubs, and restaurants – is a weekend destination for Richmonder’s looking to socialize, drink and explore downtown. With those types of venues, the neighborhood has seen ebbs and flows of crime and violence over the years. 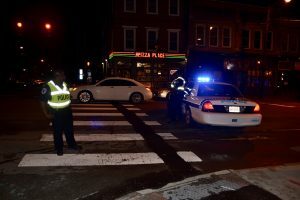 Patrolling these late-night pedestrian-packed streets started as an overtime gig for one of the officers – promising a bit of extra cash for extra hours worked – but turned into a mission of sorts for these veterans of the RPD. “Sometimes you start doing things maybe because you need some extra money or something like that, but then once you get into it, you start really enjoying what you do,” said Marshall. Marshall has worked in the RPD for 20 years, moving through various positions before settling with a spot in the Special Operations Division, which also specializes in the management of major events. Jones, a Detective in Personnel, has dedicated over 25 years to the RPD. And the kickback has been strong recently. More so, after a triple shooting and homicide on the 1800 block of East Main Street on June 18 near the Farmer’s Market. Shortly before 3 am, officers were called to the area for a report of two persons who had sustained gunshot wounds. While units were on the scene, a second call was received for a third victim, who was tragically pronounced dead at the hospital sometime later. 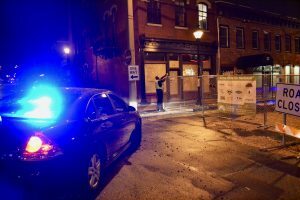 The incident marked the first murder investigation in Shockoe Bottom since 2011.“There was a big uproar from the local business community,” said Marshall. As we looped around the 17th Street Farmer’s Market, Marshall pulled over to fix a sign that had been misplaced. The area is blocked off for a $3 million renovation that is currently underway, with plans to reopen the central part of the market as an open-air pedestrian plaza. “Tonight seems slow to me – what about to you?” Marshall asked Jones as we walked down an alleyway and turned into the street. The pair stopped every few feet to check-in with the on-duty officers at each bar, shake hands with the club owners, and greet local residents on the street. Although they gather in this area for different reasons, they’re all regulars. “This is the action area. This is where you’ll find things happening,” said Jones. 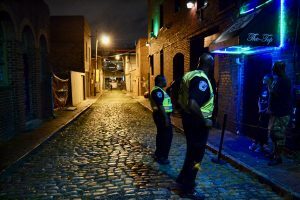 Historically speaking, Shockoe Bottom has been unfortunately stereotyped as an area strewn with violent crime. However, in more recent years, most of the activity Marshall sees around the bars is negligible; amounting to drunk in public charges, cars that need to be towed, and resolving misconstrued arguments. In order to deter violent activity, the RPD began to place extra officers in the area. Each weekend night, there are overtime shifts available – 11 on this night – for officers who would like to volunteer. Some nights are lower staffed than others, but Marshall claims there is a strong following of officers willing to step up. “Public safety is the main concern down here; we try to make sure everyone gets home safe. For the last several years, it has been working, crime has kept decreasing,” he said. It’s now pushing 1 am on a mid-summer Friday, and the most ‘action’ we’ve seen is a group of drunk college kids screaming at each other, a distressed friend of a friend who got kicked out of a bar, and a few illegally parked cars. It’s the dead part of the night–the part of the night when people stop going to bars, but haven’t started leaving the bars. Because of this, some of the streets are nearing an unexpected silence and causing an uncanny feeling of mystery; this is Richmond after hours. That silence might offer some modicum of progress at least down at the Bottom. Yet Richmond is still experiencing an uptick in crime, which has been heavily reported on in recent months. There were 61 homicides in the city of Richmond in 2016. And as reported as early as February, in the first 36 days of 2017 violent crime was up 25 percent. Last call, and closing time. People begin to meander out of the bars in the 1700 and 1800 blocks of Main Street. If they don’t leave now, they’ll be kicked out soon. It’s still quiet though – with the exception of a few squealing girls who are running by to escape the summer rainstorm. They are followed by a group of people crowding around a wing place for a late-night snack. Most of those customers make short business of their search for food, because the streets are starting to shut down. 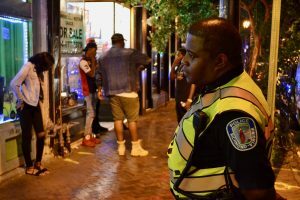 As a part of the initiative to decrease the potential for violence, the officers working under Marshall begin blocking the streets surrounding some of the more popular bars. Westbound traffic and northbound traffic are blocked, and traffic is forced eastbound towards Dock Street and out of the Bottom. It’s an orchestrated process – with all moving parts (eight police cars to be exact) working together to get the job done seamlessly. As for the area’s previous reputation for violence, Marshall specifically refers to the “cruising” trend. This consisted of cars riding aimlessly through the busy areas of town, which the Shockoe Bottom structure and culture seemed to incubate for several years in the late 90s and early 2000s when the area was even more robust with business and late-night activity. “These days, we are having more violent crime problems in the government housing areas. That’s mainly where you see the crime rates increasing and that’s what contributes to those city-wide numbers people hear about,” said Marshall. This is reflected in the city’s crime statistics. 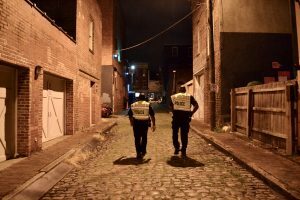 According to the Richmond Times Dispatch homicide database there have been another 61 homicides in Richmond since January this year, forcing the city to acknowledge new solutions and initiatives are needed to reduce crime. “Downtown is really a melting pot of people, and a lot of times, all of those people don’t understand the things we prevent,” added Jones. Although these late hours are “normal” to him, the majority of Marshall’s time is spent in his daily assignment. In the Special Operations Division, violent crime is not a daily occurrence. Marshall’s day-to-day team in the RPD works traffic, motorcycles, horses, the K9 units, the aviation unit and the homeland security unit. As the tactical Lieutenant, Marshall specializes in the K9 and Aviation units. This means managing protests, official visits by political figures, and other special events. Given the nationwide political and racial controversies that have arisen in the past few years (most notably in law enforcement and police culture), Marshall has witnessed the conversation first-hand and has watched change occur. Still, Richmond is the former Capital of the Confederacy – a city in the national conversation because of monuments and affordable housing shortages – so those issues cannot be ignored. 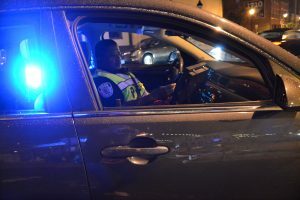 As Police Officers and African American residents of the area, Marshall and Jones said they are fully aware of that, but that does not deter them from continuing to follow their mission to make Richmond a safer place for everyone.